President Emmerson Mnangagwa has commissioned a $165 million Arcadia Lithium Mine plant in Goromonzi that is expected to start operating soon. 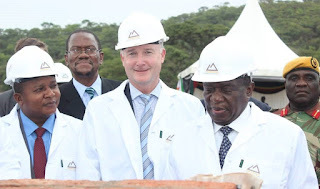 Speaking at the ground breaking ceremony, Cde Mnangagwa said there are prospects of lithium beneficiation in the country and called for people in Goromonzi to be given priority in terms of employment opportunities. He challenged school children to study science subjects which he said are critical to the development of a green economy. Arcadia Lithium Mine is a joint venture between Australian based Prospect Resources and the government of Zimbabwe.